Wednesday June 3rd 1925 I was in bed most of the day. Weather very warm. Hattie very busy. I had a letter from Mrs Smith. Thursday June 4th 1925 Very warm. Still in bed. Hattie had Elmer Anderson here doing painting. Mollie came to stay all night. Ida here in the evening. Letter from Lydia. wrote her. Friday June 5th 1925 I sat up a little. Weather very warm. Rob out of town for the day. Hattie to a party at Mrs Gibbs late in PM. Saturday June 6th 1925 A very warm day. Hattie down town in forenoon and to Mrs Grants to a party late in PM. Rob back at supper time. I really felt very miserable. Sunday June 7th 1925 Hattie called Dr Hazard to see me. I felt so weak. Rob away again early. It is the Sunday we furnish the flowers at the church for Mother. Ott came and took Hattie. Afternoon in bed. Ott and Fannie here in evening. Monday June 8th 1925 In bed all day. Dr Hazard here in forenoon. Hattie to an Old Ladies board meeting and later over to Otts to his class reunion dinner. I wrote L D L. weather cooler. 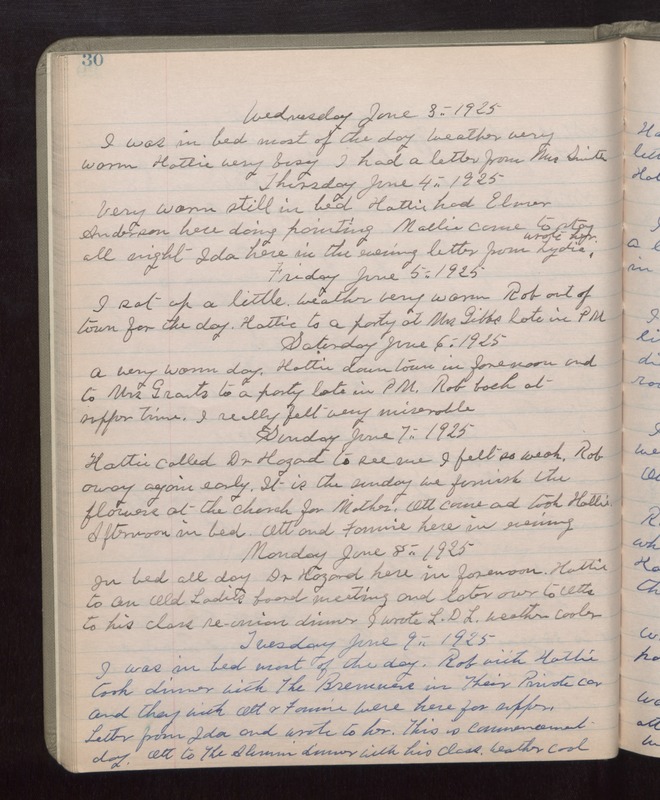 Tuesday June 9th 1925 I was in bed most of the day. Rob with Hattie took dinner with The Bremners in Their Private car and they with Ott & Fannie were here for supper. Letter from Ida and wrote to her. This is commencement day. Ott to The Alumni dinner with his class. weather cool.